Note: Gujarat state elections results have been declared. The ruling Bharatiya Janata Party (BJP) has come back in power in the state. In order to defeat BJP, among other efforts, Indian National Congress (INC) party had stressed that the ship-breaking industry, which declined during the BJP rule, would be revived if it is voted to power in its manifesto. It is noteworthy that the ship breakers had threatened to vote for Congress if Blue Lady (SS Norway, SS France) was not allowed dismantling permission. 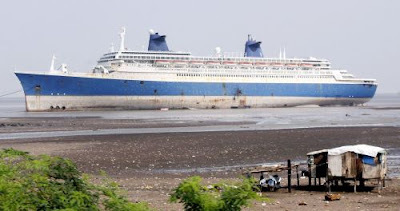 Bhavnagar, wherein Alang ship-breaking yard is situated falls under one of the two assembly constituencies of Bhavnagar North and Bhavnagar South. Alang Ship Recycling Yard is located 50 km southeast of Bhavnagar. Shaktisinh H. Gohil, the Congress candidate from Bhavnagar South, defeated the BJP candidate Jitubhai Vaghani. The Times of India reported on 17 December, 2007 that there are already 35 ships awaiting cutting permission from the government and 20 are on their way. Note: Are Hazardous Wastes and Hazardous Materials Synonymous? No, said Supreme Court and Basel Convention. Yes, says Ministry of Environment & Forests even as its proposed Hazardous Rules make India least resistant to global waste flow. Startled by the proposed Draft Hazardous Materials (Management, Handling and Transboundary Movement) Rules, 2007 of Ministry of Environment & Forests currently headed by the Prime Minister, environment and public health researchers and activists have termed it as a gross act of linguistic corruption to satiate hazardous waste traders' naked lust for profit. Unlike what is being attempted by the Ministry, the classification into hazardous waste is based on the system for the classification and labelling of dangerous substances and preparations, which ensures the application of similar principles over their whole life cycle. It is an effort to undo whatever good has been by the Supreme Court and its committees.